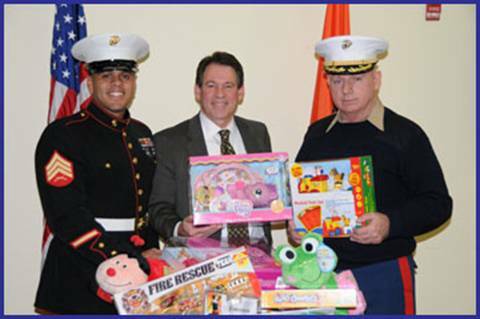 Nassau County Legislator Francis X. Becker, Jr.
Legislator Francis X. Becker, Jr. and the other members of the Nassau County Legislature recently joined with Major Chuck Kilbride and the United States Marine Corps to participate in the Marine’s Annual Toys for Tots Program. Each Legislator donated a new, unwrapped toy that will be distributed to disadvantaged children throughout Long Island to help spread joy this Holiday Season. Shown in photograph with Legislator Becker are Major Chuck Kilbride and Brian Gomez of the United States Marine Corps.